Florida is for the birds! -Beautiful, majestic, birds. To enter The PGA Village in Port St. Lucie, turn left on Perfect Drive, lined with pin oaks, palmettos and pines. In danger of extinction, tall sand cranes appearing like a Jurassic Park variety of bird, seem to abound as captured in the photo on a bridge on the Ryder course. Glorious bald eagles soar, along with magnificent blue herons, white cranes, and egrets. 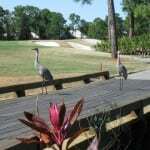 Snowbirds contribute to the state economy, hoping as all golfers for the grand birdies on the course. All 3 courses at The PGA Village are truly wonderful, starting with the Ryder course which must have been easy since we both had close to our best scores. Flat like Florida’s overall terrain, the wide fairways are lined with homes all having a lovely patio area enclosed with netting and pretty yards. The Pete Dye course was more challenging, as you would expect with his usual undulations in the fairways. The everglades or marshland blend with natural cart paths, framing the course and distorts your depth perception. Difficulty in determining the best shot placement is a cornerstone of Pete Dye designs. The afternoon play on Wanamaker made our first 36 holes day in quite some time. It was a case of saving the best for last. A gorgeous, intriguing course, with natural water hazards, elevation and pot bunkers on steroids, Wanamaker gave us the highest scores and biggest thrill. We “wanna” go back for more. The learning facility was much more than expected. It is a wonderland of golf, featuring 2 driving ranges with 110 tee boxes, multiple greens from various time periods, 9 practice bunkers with distinct varieties of sand, a fine restaurant and great golf shop. Charge $25 for a whole day of use, from morning till 9 at night thanks to the sophisticated lighting, and you have the utopia for golf practice at The PGA Village. The available training options are unmatched from a technological and personal experience viewpoint. They say consistency is more important than the putting score. So maybe consistent golf isn’t an oxymoron? The Taylormade MAT system projects your image 360 degrees on a screen and compares the swing pattern to any overlaid image of a Taylormade pro such as Tom Watson. Every aspect of the training center focuses on what you can and cannot do. Stretching and physical ability is incorporated into your swing design. One of the goals is to make your hips act like whips. This is not a one day makeover, although you can concentrate on any given area of needed improvement. Students come from near and far. Some are working for a degree and some are just passing through. Several international golf teams have attended the program to prepare them for the 2012 Olympic competition. The Hilton Garden Inn serves hot morning beverages in the lobby and oranges on the counter. Their Sam Snead restaurant is a great tribute to the legendary namesake. Our favorite memorial was the photo of Sam with Andy Griffith, bagging birds after a hunting expedition. By chance, we encountered past associates from Texas and England there, a testimony to the popularity of The PGA Village. We are sure to return to this fabulous resort, just 30 minutes from the beach. To vacation, live or to winter, if you ever thought about Florida, now is the time to join the birds.